EXACTLY! We are all learning how to optimize our play style. No one is the uber leet player at this point. And anyone who says they are, and everyone else is a newb, well, they are full of hot air imho. I’m a newb and proud of it! I’d rather take the time to learn my class, abilities, fight specifics and just enjoy the newness of everything. Rather than chain-pull face-rolling PUGs. Seriously. I’m playing the game (and paying for it) to have fun! Game is for fun? I thought it was serious business! It has been interesting to watch some people seem to have absolutely no fun, as they raced up to 50, then race through flashpoints (spacebar! spacebar!) I wonder why, exactly, they are playing. I think it’s awesome to have an open slate ahead of us with this being a new game with so many new locations and quest chains to explore. I don’t know about anyone else, but I’m totally relishing the chance to be unabashedly inexperienced at this game. I still love WoW, but playing since late 2005, I can’t say there’s anything with which I feel unfamiliar. 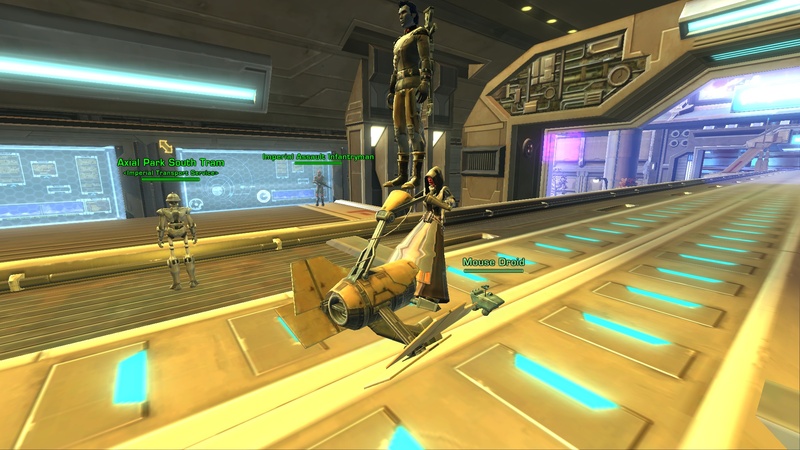 That’s what SWTOR is doing for me right now, and I love it. Exactly! I love not already knowing the most efficient route for getting from place to place, and what quests will be in store for me when I get there. Even just getting the opportunity to gawk at a gorgeous new vista rocks. My other guildie is a little worried -because- he doesn’t know every little detail about this game like he does for WoW. While I’m very sure that if he keeps playing he will become the expert on everything, it’s really not something that he needs to be worrying about now! I too find the lack of ‘knowing everything’ refreshing, though I’m sure I’m less intimidated by everything about the game compared to those who haven’t played MMOs before. You touched on something I was a both excited for and worried about: there are people playing this solely because they love Star Wars. On one hand, I absolutely love that. There’s nothing like sharing a nerdy passion. On the other hand, I was worried that, given the game’s similarity to WoW, there would be a large percentage of elitist jerks who badger this “new” audience into submission. It seems to not be a ubiquitous problem at this point but I don’t run too many flashpoints with strangers, so I’m not sure. What? The game has been out for how many weeks now? I am tank spec in PvE and I can tell you, not only do I get labeled as a NEWB! quiet often for things outside my power (e.g., losing aggro while being CC’d) on unfavorable days I get compared with companions. One person even told me that his companion tank was better than me. I kept quiet and finished the heroic 4 mission with him, his guildie, and one other. By some freak accident (a bug at the time, instance owner picking up an item before everyone else in the group could pick it up — “finishing” the instance) he and his guildie were unable to finish the mission. The 3rd person left and I stayed around just long enough to give them the hope that I would be helping, but dropped group a moment later with “Just have your companion tank it.” It was satisfying. But yeah, people need to chill. You gave them their just desserts, served cold. Sith approved. Being new is one of the things I’m enjoying most about playing SWTOR right now. I’m not perhaps quite as unsullied as I was that first week of playing WoW, which was after all my first MMO, but it’s absolutely wonderful being able to explore and try things out, secure in the knowledge that everyone else is in the same boat too. SWTOR has some things that seem to surprise a lot of WoW refugees—for example, they clearly designed flashpoints in such a way that the “tank” isn’t really expected to tank everything at once. Even a well-geared tank will often die if they try this at level. Most DPS are durable enough to handle one or two non-elites, and as far as I can tell, the designers expected them to do so. Crowd-control makes a huge difference, and I love it. I don’t know where everything is. I don’t know what the best options are in a given conversation. There aren’t any “standard builds” for the classes I play yet. And by all that is good in the world, I’m so happy about that. I’m almost afraid to get to the level cap, but I’m in no hurry, and there are always plenty of opportunities to sit back and play a different class. The variety of play styles is quite impressive given that there are only four base classes per faction. I am also a fan of being able (heck NEEDING TO) cc. I was sad my mage never got to cat or sheep things during Cata…And I am also enjoying not having all the information about everything being decided upon and codified on a website somewhere. I am basking in the newness. I’m enjoying my newb-filled experiences personally. Exploration and experimenting with different things are what make playing so much fun. As a healer, I’ve let the tank die at the most inopportune moments while still getting used to my toolbox, fallen offa bridges, pulled elites who I thought were non-elites, and got lost countless times in various planets. Knowing everything about a game can take away its mysterious element and SWTOR has definitely brought back the shiney new puzzle solving lure for me. Newb and proud! After playing WoW for over 7 years, I’m absolutely loving being a newb in SWTOR. I roll a Sith Warrior to level 9, didn’t like his look, deleted it. Rolled the new look to level 5, decided I liked the original look – deleted it. Rolled the next one to level 12 and I think I might delete it. And I’m having so much fun. Everything is new, it doesn’t feel tiresome. I love getting a feel for the game, learning WTF I’m supposed to do in any given class. I have so much to learn. In WoW, having played every class, every spec, from 2004 to present day, I had nothing else to conquer. The pointless grind wasn’t enough for me since I had (modestly) mastered every class and nearly every situation. I’m so damn happy to run around SWTOR and not know where my trainers are, not know where my rest zones are…hell, I’m as lost as can be right now and loving it. It really makes me sad to see the trolls pop up in this game, or the (already!) bored level 50s standing around with nothing to do. I’m taking my time, rolling some alts, being nice to people, making friends, and taking it slow. This is our chance to relive what vanilla WoW felt like, and racing through content is the absolute worst thing a gamer in SWTOR can do right now. It’s NEW, and it’s only new once so enjoy it. The point is to learn, absorb, experience something new, and get lost in a Star Wars world. It’s not to race to the end and try to show off what you’ve earned in game. To the jerks and elitists in the game right now, I’d only say this: you’re not in Azeroth any longer. This game was developed to provide a richer play experience, through storytelling, voice acting, and more intimate character development. If you ignore that aspect, you ignore the reason to play SWTOR in the first place. Go back to WoW and race to endgame and race for the highest gear possible; then stand on a mailbox and hope people think you’re cool because you have no life. This game is fantastic, minor problems and all. It really shows you how little MMOs like World of Warcraft deliver in terms of making you care about the world or your character. Early WoW did that, when it was brand new, but lost it over time. This does it (again), in a unique way, and we should all be thankful for it. Right now I’m just leveling what I feel like, when I feel like it, and meeting really nice people along the way. I love the Star Wars nerds. This game is really special, for those willing to let it blossom. I hope we don’t get too many WoW-heads coming over to troll and put down people who wanted something DIFFERENT. WoW still exists for those insecure gamers who think virtual gains and smackdowns lead to self esteem.